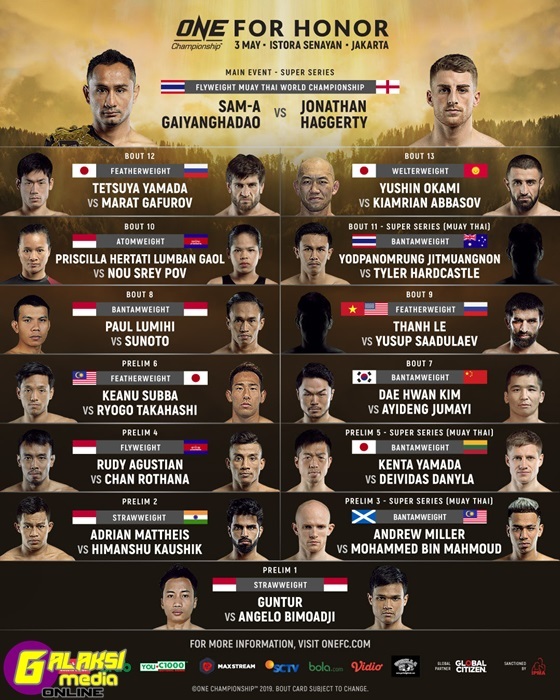 10 April 2019 – Jakarta, Indonesia: The largest global sports media property in Asian history, ONE Championship™ (ONE), has just announced the complete card for ONE: FOR HONOR, set for 3 May at Istora Senayan in the bustling Indonesian capital of Jakarta. Once again, the absolute best in world-class martial arts talent will storm the ONE Championship ring to showcase their incredible skills. In the main event, ONE Flyweight Muay Thai World Champion Sam-A Gaiyanghadao of Thailand will defend his title against Jonathan Haggerty of the United Kingdom. Making his ONE Championship debut is Thanh Le of the United States who takes on Russia’s Yusup “Maestro” Saadulaev.